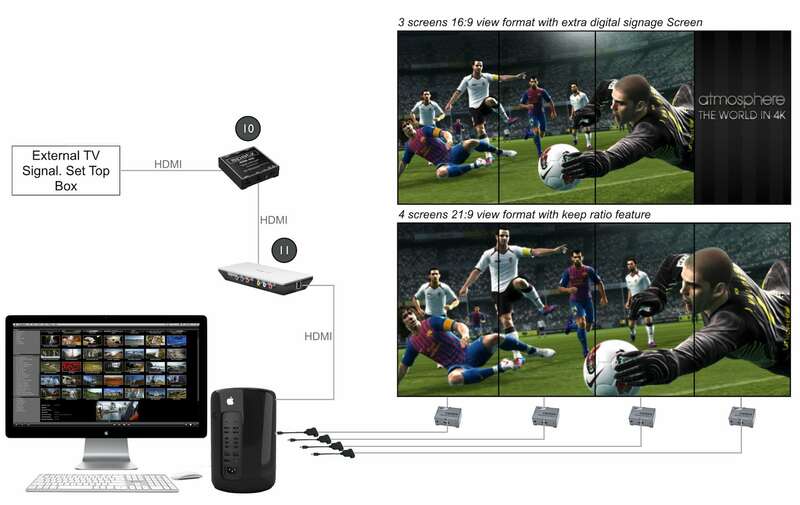 The standard requirement for the atmosphere platform are 4 full HD displays to display its high resolution 4K content. The screens can vary between 46”, 55, 75 and 95” depending on the location size and the individual needs of each customer. atmosphere media recommends the use of professional displays that are build for continuous operations and designed to be installed in portrait format. (in this picture 4 x Ultra Thin Bezel Displays). The atmosphere Time Key must be plugged at all time into a USB port of the MacPro. The Mac Pro is compatible with any desktop monitor. The desktop monitor must be connected to the Mac Pro HDMI output. Note: The monitor resolution should not exceed HD resolution 1920×1080. The atmosphere Controller iOS App has been developed to control the atmosphere media player© from an iPad. Audio out: The Mac Pro audio port with a speaker icon is a 1/8″ stereo minijack for audio line out. It can use analog audio and digital S/PDIF fibre optic cables. Audio devices you connect to the port will appear in System Preferences > Sound > Output. You can also use an USB audio interface like the Focusrite Scarlett 2i2, high quality audio interface with 24-bit, 96kHz. When connecting more than 3 displays to the Mac Pro it is necessary to use Active Mini Display Ports to HDMI or DVI connectors. We recommend 4 MDP2HDS Active Adapter Mini DisplayPort to HDMI Active Adapters from startech.com or (when using DVI) 4 Sapphire Active mini DP to SL-DVI-D adapters to convert the Mini Display Port to DVI signals for viewing on DVI-equipped displays. (Important: Note that HDMI and DVI cables can only be 10 meters long depending on the cable quality. For longer cabling (up to 100 meters) it is necessary to use extenders that will boost the signal. Other options are Fiber Optical cables or CAT cables with signal converters. The EDID Managers simulate a constant connected display for the Mac Pro and makes it the ideal solution to prevent video loss and screen arrangement errors if displays are disconnected for any reason. We recommend EDID managers from the companies Gefen (HDMI Detective Plus). Customers may want to be able to use the 4K video wall to show major sports events from an external TV source. 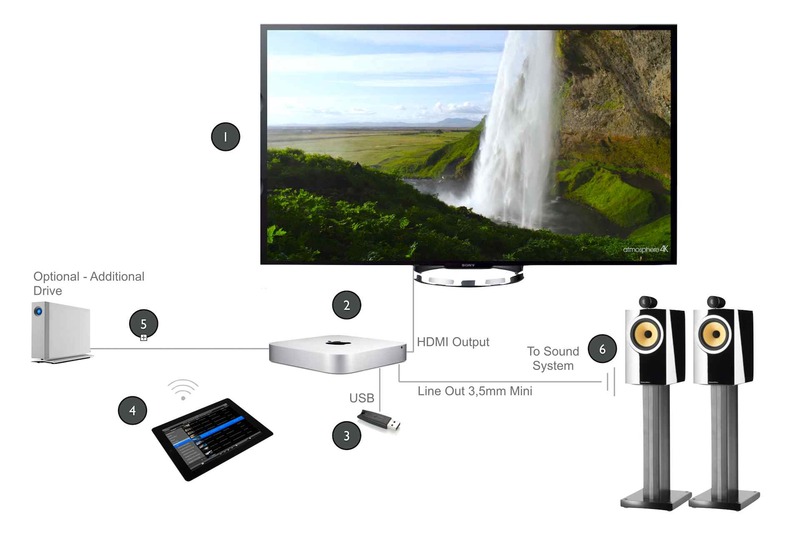 atmosphere media player 7 supports the Blackmagic Intensity Shuttle for USB 3.0 to be able to grab an external HDMI signal and display it on the 4K video wall. It can be selected to utilize 3 or 4 screens of the video wall (16.9 or 21:9 aspect ratios respectively). Note: When 3 screens are used the TV signal is shown on the leftmost 3 screens. The 4th screen is used to display customer’s brand or marketing messages (also enabled by the atmosphere media player software). A programmed EDID Manager/Splitter is delivered by atmosphere media to send the correct signal to the grabbing card. atmosphere media has programmed the USB 3.0 BlackMagic Intensity card to be able to grab an external HDMI signal and send it to the screens. The software allows to send the signal to 3 or 4 screens. The displayed format for 3 screens is 16:9, the displayed format for 4 screens is 21:9. Learn which Mac computers can use a UHD or 4K display. The standard requirement is a UHD display in 16:9 format. atmosphere is compatible with all renowned display brands (Samsung, LG, Sharp, Sony, Panasonic, Philips ..) and all screen sizes (55”, 65”, 75”, 95” to 105”). The HDMI input of the UHD display must be connected to the HDMI output of the Mac Mini. The atmosphere Time Key must be connected at all time into a USB port of the Mac Mini. Note: atmosphere media player 7 has a software license key. The atmosphere iOS Controller App has been developed to help you control one or more atmosphere media players© from a single iPad. 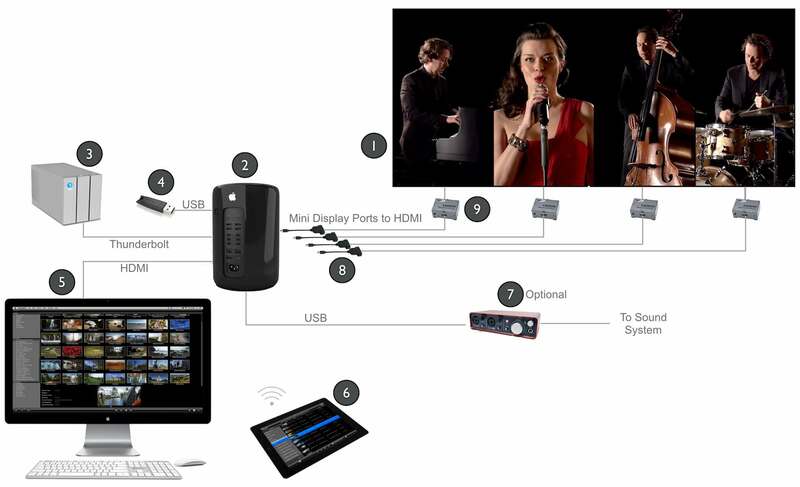 You can use this application to remotely control an atmosphere media player© running on a Apple MacPro 6-Core computer (Multiscreen) or an atmosphere media player running on a Mac Mini i7 computer (UHD single screen solution). It is possible to connect a faster (Thunderbolt) and larger capacity drive to the Mac Mini to assure enough capacity for future content updates. The 3TB LaCie RAID thunderbolt 2 drive must be connected to the 2nd thunderbolt input of the iMac. atmosphere recommends to use professional sound systems (2 loudspeakers left and right from the UHD display or a soundbar that creates a reasonable stereo effect from a single cabinet). Audio out: The Mac Mini audio line is a 1/8″ (3.5mm) stereo minijack digital/analog. It can use analog audio and digital fibre optic cables. Audio devices you connect to the port will appear in System Preferences > Sound > Output. You can also use an USB audio interface (like the Focusrite Scarlett 2i2, high quality audio interface with 24-bit, 96kHz).